We are excited to announce a new sponsorship deal between Puck Stop and the Elite Ice Hockey League. 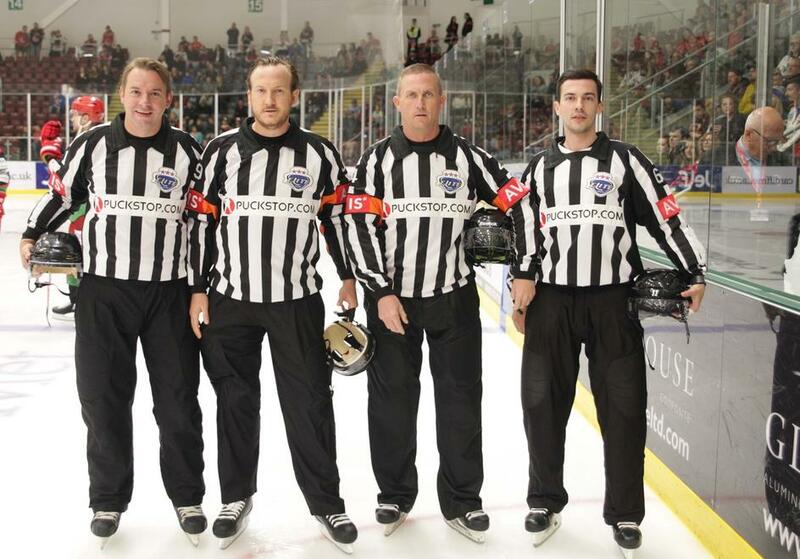 The new sponsorship deal is for the EIHL referees and officials this season, we will be the main jersey sponsors. The eagle eyed amongst you may have noticed our logo first appear on officials jerseys in the recent Cardiff Devils vs Milton Keynes Lightning game aired on Freesports. Over forthcoming game nights, you will notice the Puck Stop logo emblazoned across officials jerseys up and down the league. We are excited to add team stripes to our portfolio of Elite League sponsorships alongside netminders Ben Bowns (Cardiff Devils) and Jackson Whistle (Sheffield Steelers). The referees and officials are an integral part of our game at all levels, and we are pleased to be represented by them. “This is a deal that’s pleasing from our point of view, with Puck Stop lending their support to a great group that are often forgotten 12th team of the Elite League,” he said. “We’re proud of our officials and Puck Stop coming on board shows the commitment we have in them and the job they do. We at Puck Stop thank the Elite league board for this opportunity, and look forward to working together also, we have the feeling it’s going to be a very exciting season!